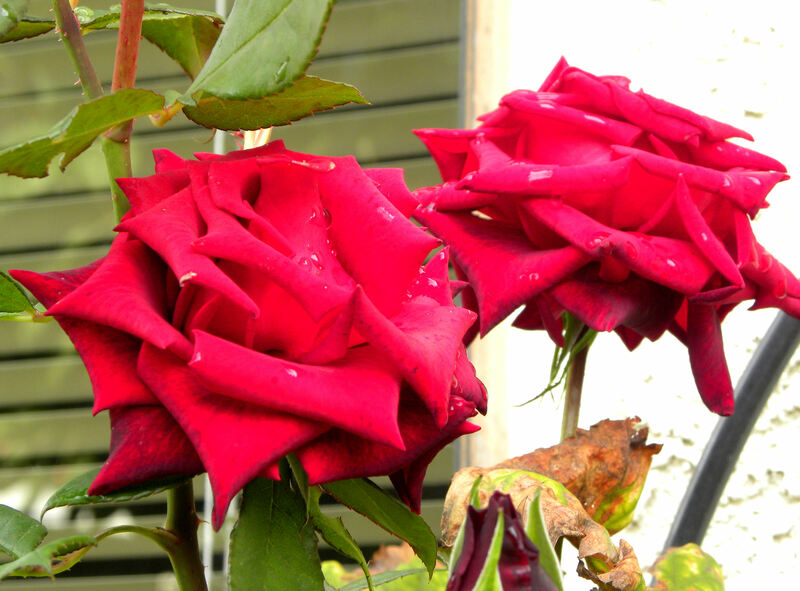 I love this rosebush. It's my most reliable bloomer, still blooming in late October. Harvest Mondays sure seem to roll around fast. I got my newspaper column done last night so I’d have time to photograph my garden and write my blog today. I want to get my Harvest Monday post done on Monday this week. For a change. It’s actually been a quiet week in the garden. It’s rained off and on all week so I haven’t been outdoors much. It’s early in our rainy seeaon and I don’t even have my temporary rain barrels set up. The permanent ones are full already, so I need to get the Rubbermaid trash barrels set under the eaves to catch the runoff that the gutters and downspouts don’t collect. 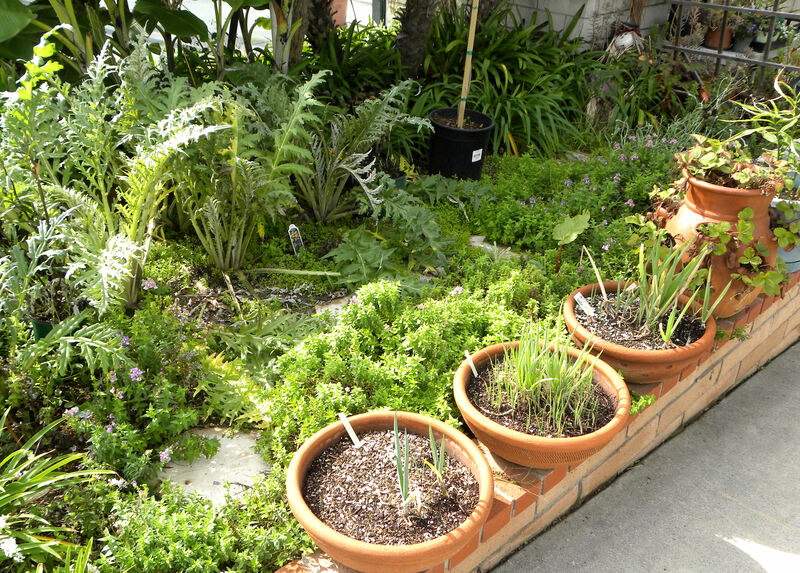 Last year I was able to use only rainfall to water my garden from December through mid-April. We saved a LOT of water last season, which is important in this near desert of greater Los Angeles that 14 million people call home. I made two dishes from the garden this week, the salmon hash pictured above and kale with pecans and dried cranberries. Both dishes turned out great. 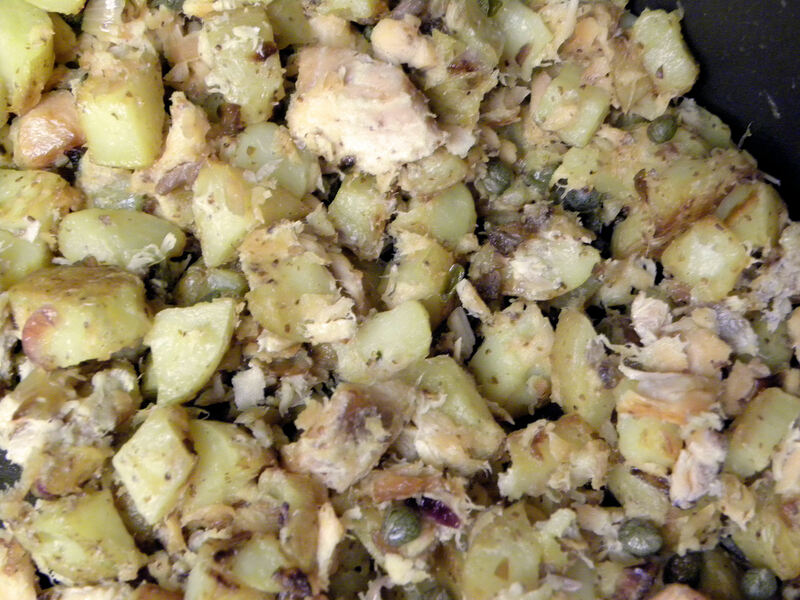 For the salmon hash, I browned diced gold potatoes in 1/4 c butter for 8 minutes, added chopped onion and garlic and sauteed for another 10 minutes before adding 1 T lemon juice, 2 T Dijon mustard, 2 tsp grated horseradish, a T of capers, and 1/4 C sour cream. What a spectacularly delicious dish. And now for a tour of my late October garden. Two tiny winter squash, the sum total of my squash harvest. I don’t know what was with the squash this year, but everything I tried failed. I got a few patty pans before my summer squash up and died. I replanted twice and got nothing more. My Amish pie pumpkins (planted too late in the year and in a Grow Pot) failed to set fruit. And the sum total of my winter squash efforts were those two miserable things above. I put them on the compost heap, too small to bother with. I have sunchokes and German butterball potatoes ready to dig. I’m too busy to deal with them this week, so I’ll harvest them next week. The yams are about an inch across, still too small to harvest. The vines are still green and growing, so I’ll wait to harvest them, hoping that they’ll continue to get bigger. They’ve gone from pencil thin to almost edible in the past month. This is my first attempt at growing yams, so it’s an experiment. In a couple of months, I’ll replant potatoes in these Grow Pots. 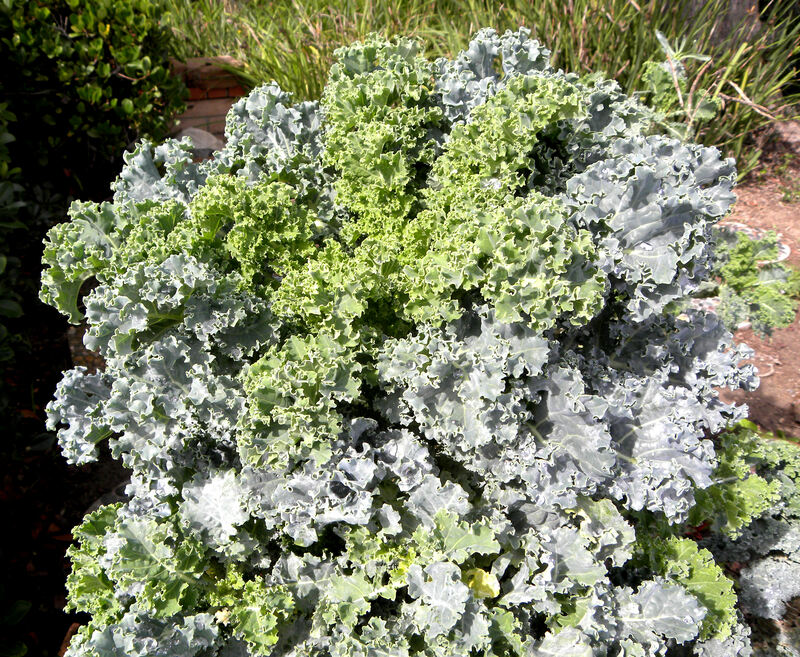 Scotch blue curled kale is really perking up with the cool, rainy weather. This plant is from 2007, still growing nicely and producing all the kale we want. 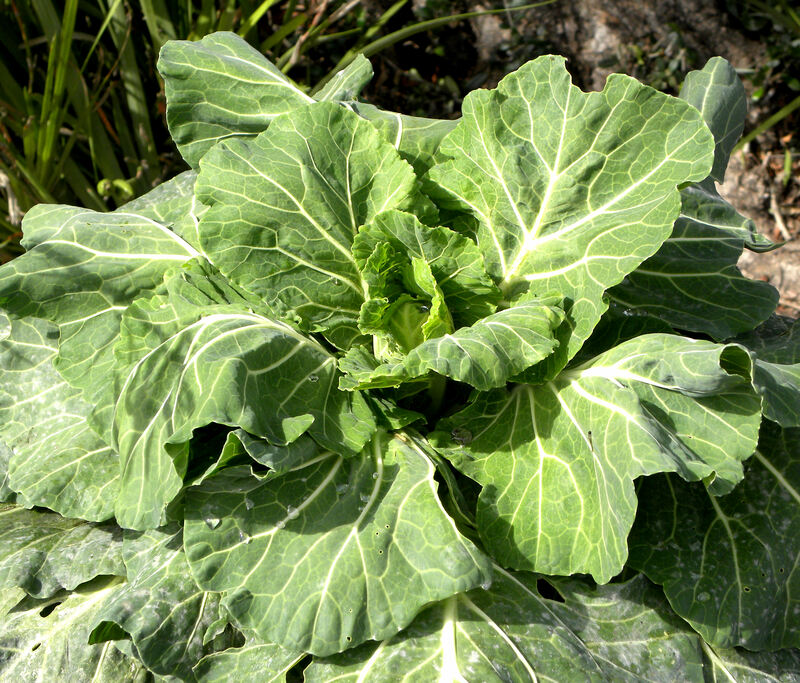 I was going to pull out the collards, but the plants are reviving now that cool weather is here. We'll get at least one more meal of collard greens from them, maybe more. 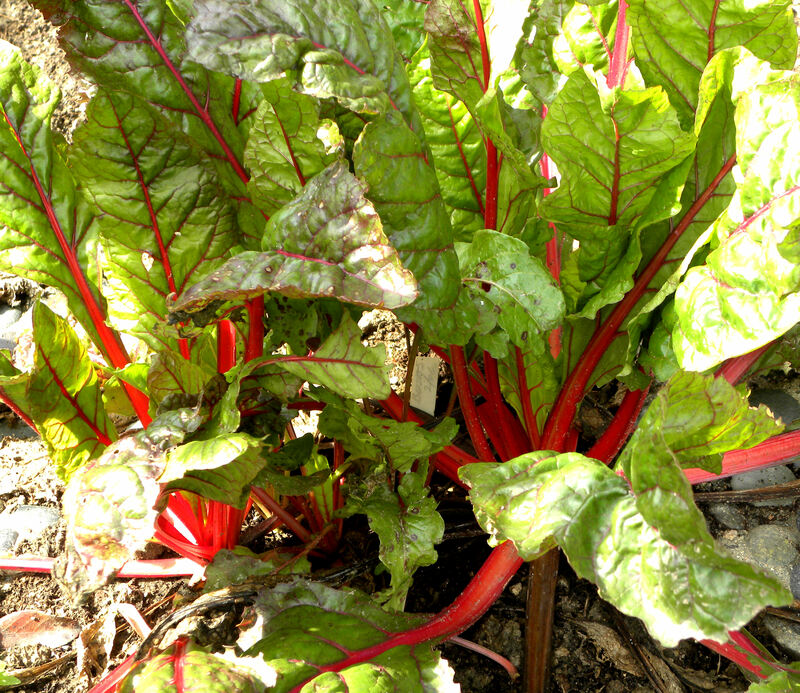 The chard languished all summer, and is just now looking good. Aphids are devastating my artichokes, but the green onions and strawberry plants look good. Ginger and horseradish are nearly ready for harvest. My raised beds from Gardeners Supply Company are a year old and I still love them. They have been amazingly productive. I'll be planting my fall crops soon. My first Cherokee Trail of Tears beans are ready to harvest. This is my first attempt at growing them. 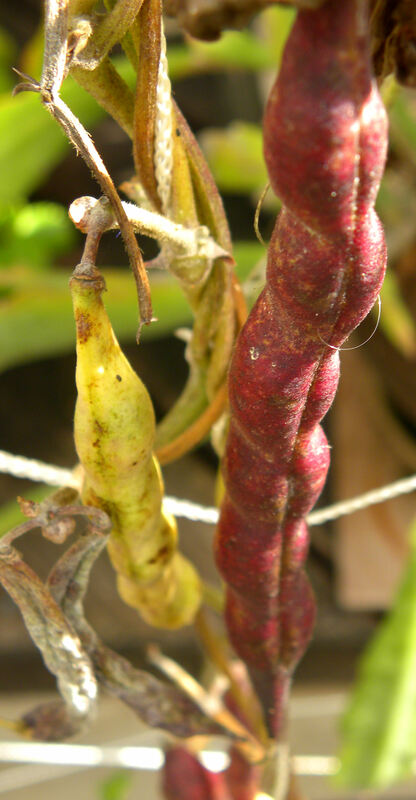 The dried pods are a pretty red. 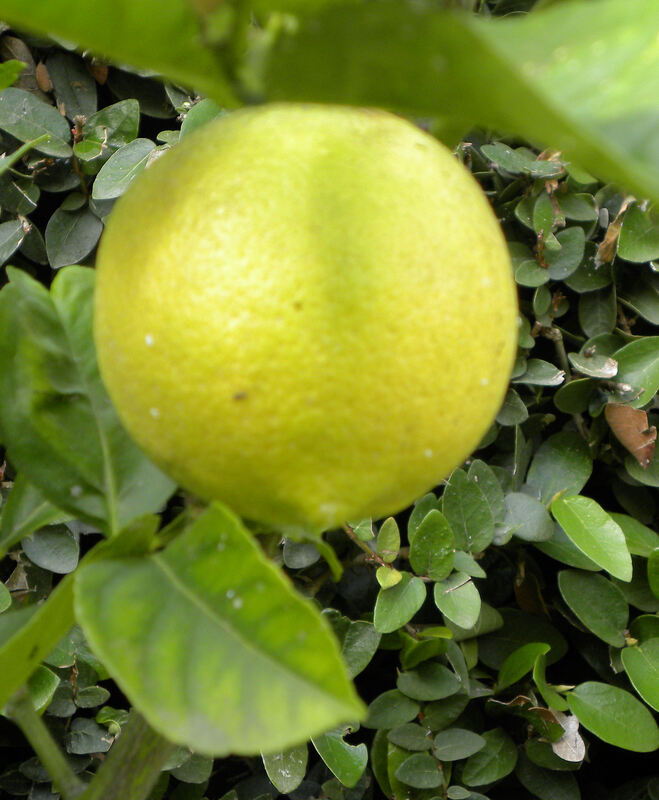 The navel oranges still have a couple of months to go before I can pick them. The tree set two crops this year, so I may get a later harvest as well. 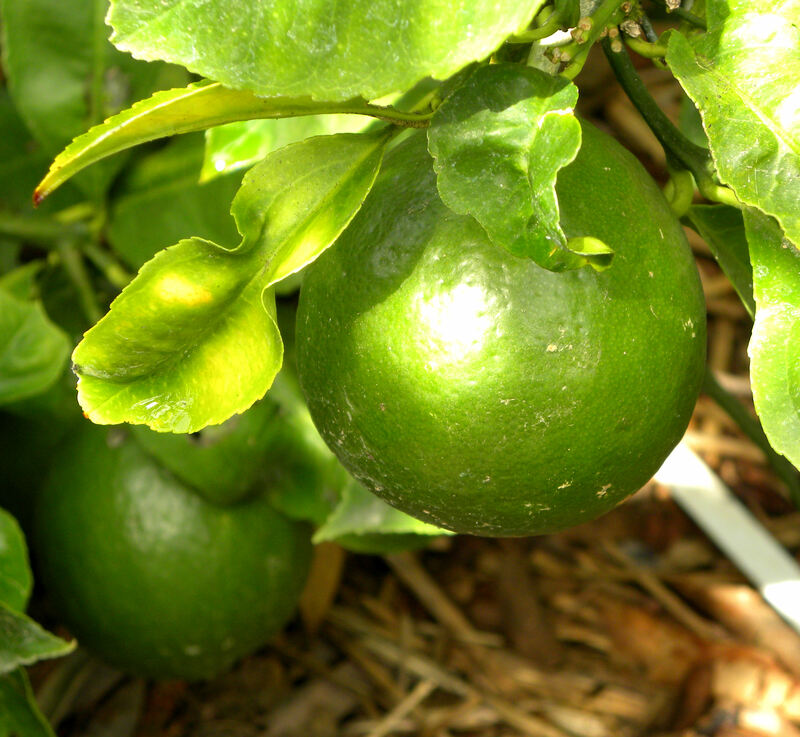 The valenica orange has a few small fruits set. It will be some time before these are ripe, maybe February. The Meyer lemon tree set a lot of lemons this year. I'm still working on Meyer lemon marmalade from last year, so I'll have to think of something to do with all that lovely fruit. 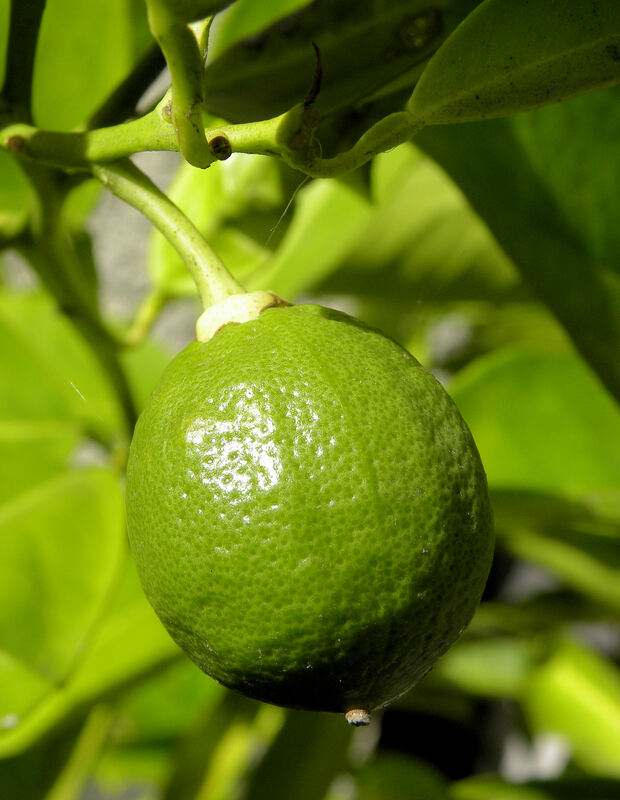 Lemons are nearly ripe on two out of three of my Eureka lemon trees. 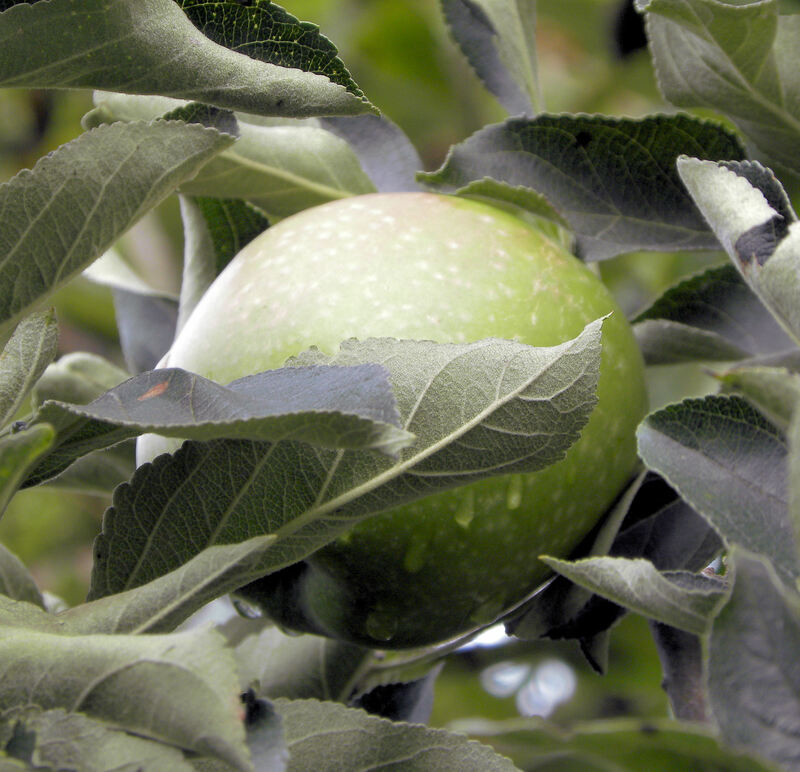 I plan to make apple pancakes with this last Granny Smith apple. 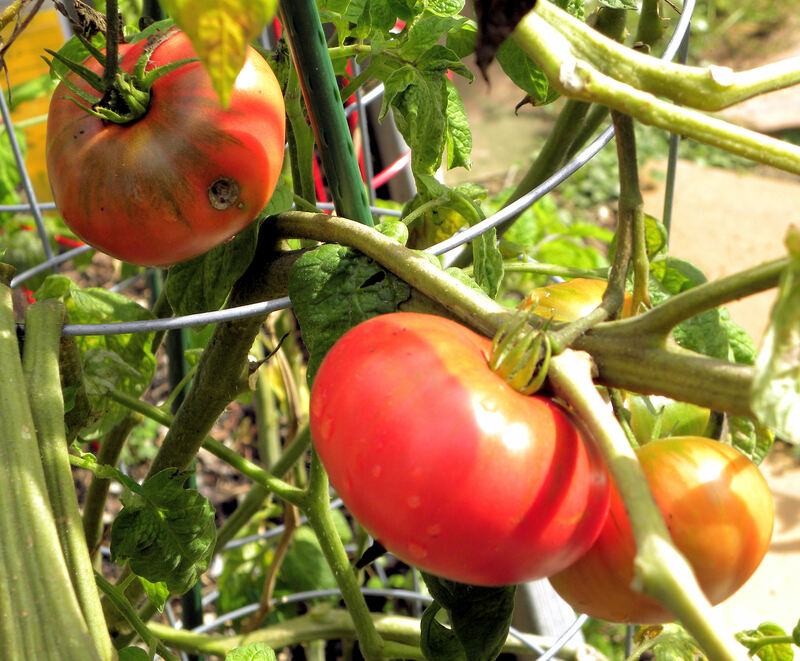 The Brandywine tomatoes were very late to ripen, but they're still giving us lovely tomatoes for salads. 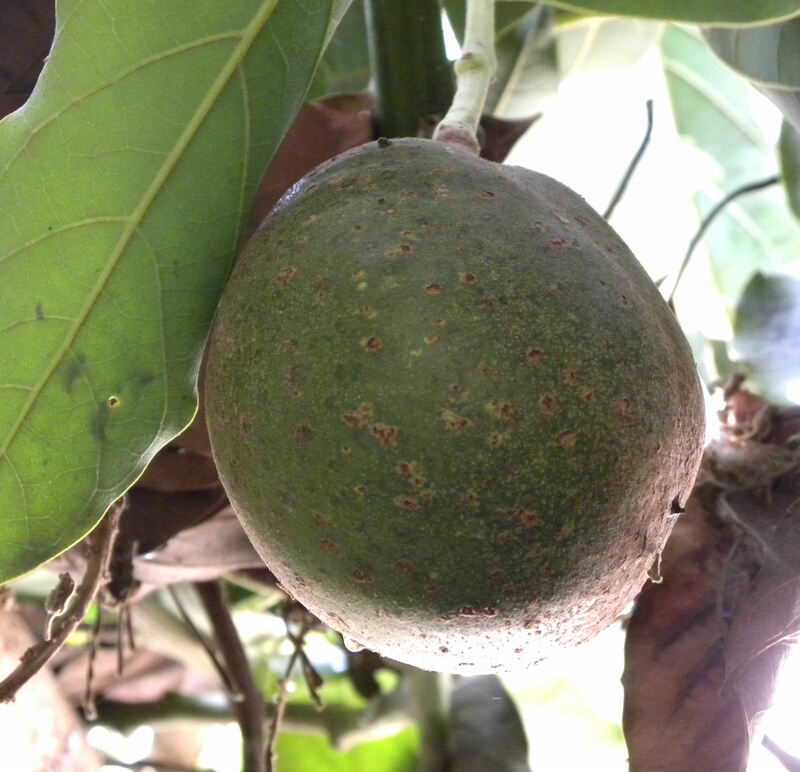 Our Littlecado avocado tree has set two fruit this year. They don't ripen until picked, but this one is still to small to pick. Maybe in January. The little water garden that I put in a year ago is looking nice. 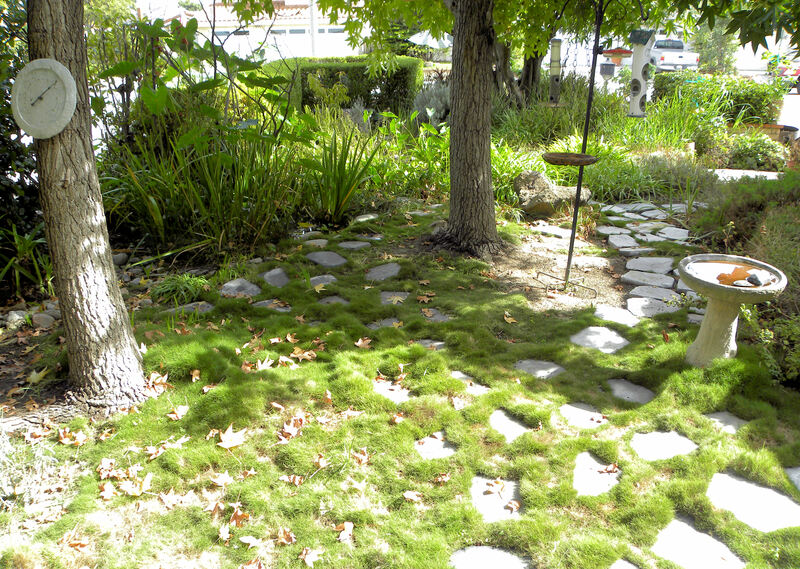 Our front yard is mostly for birds and other wildlife. We have a bird bath, feeders, and a pond in front. 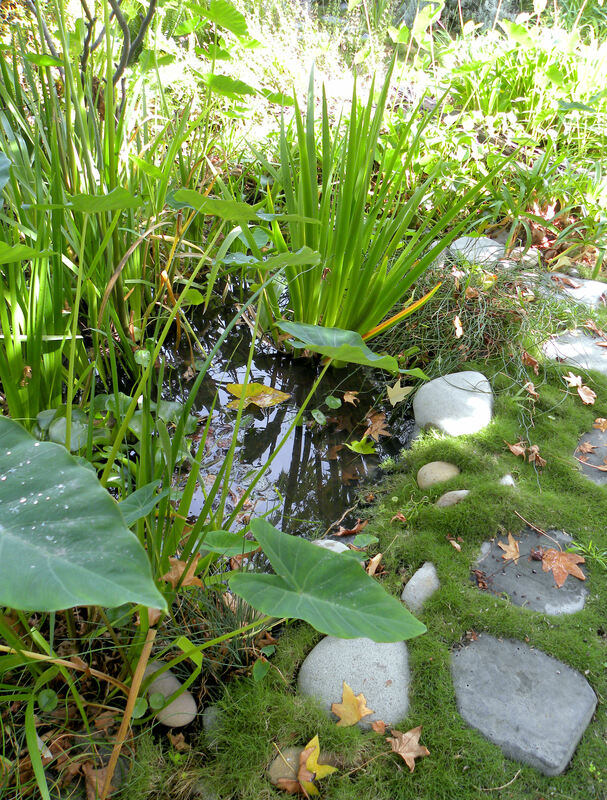 I built this pond myself more than ten years ago. I really like it. We keep mosquitofish in it so it won't grow mosquitoes. 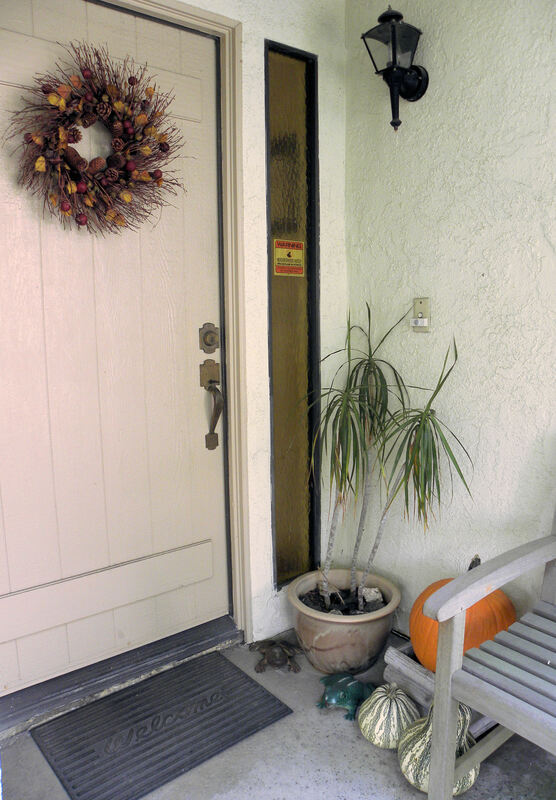 An autumn wreath, a pumpkin and a couple cushaw squashes greet our visitors. Life is good. Get out there and enjoy it. Harvest for week ending Oct. 24 2010, no fruit this week. Total 1 lb 6 oz. produce plus one egg. ONE egg. One lousy egg. The chickens are molting. Again. 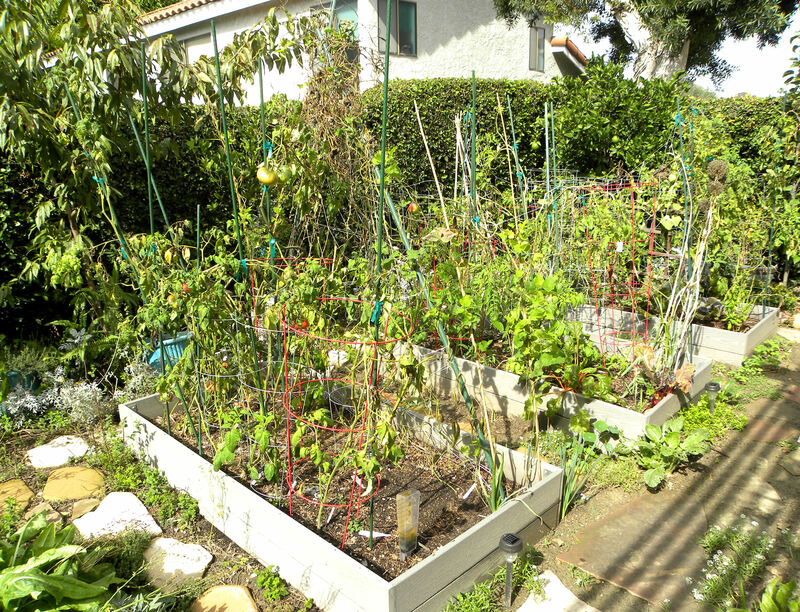 This entry was posted in Uncategorized and tagged backyard chickens, Gardener's Supply Company, Harvest Monday, photos, pond, raised beds, vegetables, water conservation, water garden. Bookmark the permalink. 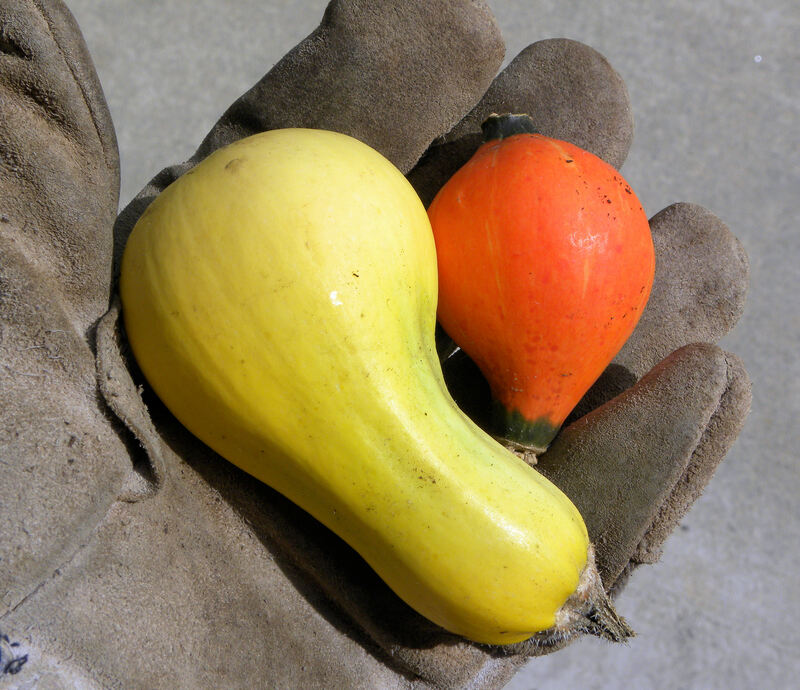 The winter squash are so little. So cute. I am loving your oranges!! 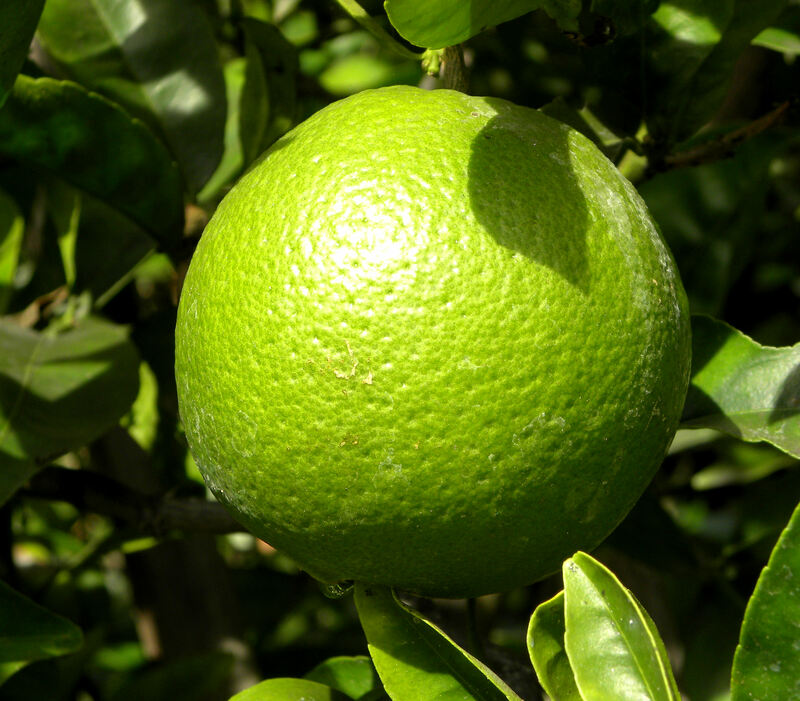 How I wish I lived in a warmer climate so I could have an orange tree! Hi Meemsyn. Cute didn’t cut it with me. I trashed them. I don’t know what was with squash in my garden this year. Just couldn’t grow them. Not even one zucchini. Now that’s a bad squash year. I love the look of that kale recipe – I’ll have to try it. Lots of kale here in the cooler part of the world. Stevie, the kale recipe is surprisingly good. Add a dash of a good vinegar like champagne chardonnay. What great produce you have, as always. I’m going to google “mosquitofish” – never heard of them. Or do you just mean any fish that eats them? 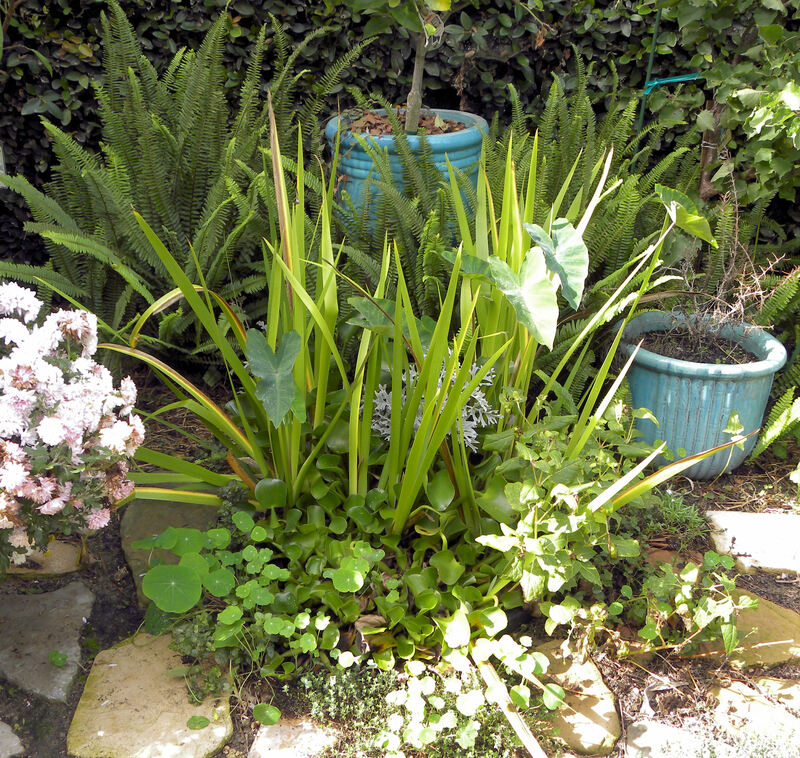 I’ve been hesitating about any kind of permanent water in the garden because of the mosquitoes. The kale recipe is very appealing. Barbara, mosquitofish are not native to our area but are supplied by county Vector Control. I think the genus is Gambusia. They’re like plain guppies. They are voracious predators of mosquito larvae. I like your Scotch blue kale, it’s beautiful, and your kale dish sounds scrumptious! I think your hens and ours are in cahoots. Our pullets are laying lots of eggs, our old gals though are molting up a storm, and haven’t laid an egg between them in almost three weeks. Thanks, Clare. Sorry to hear that your hens aren’t laying either. I got NO eggs this week. With only three hens, it’s feast or famine I guess. 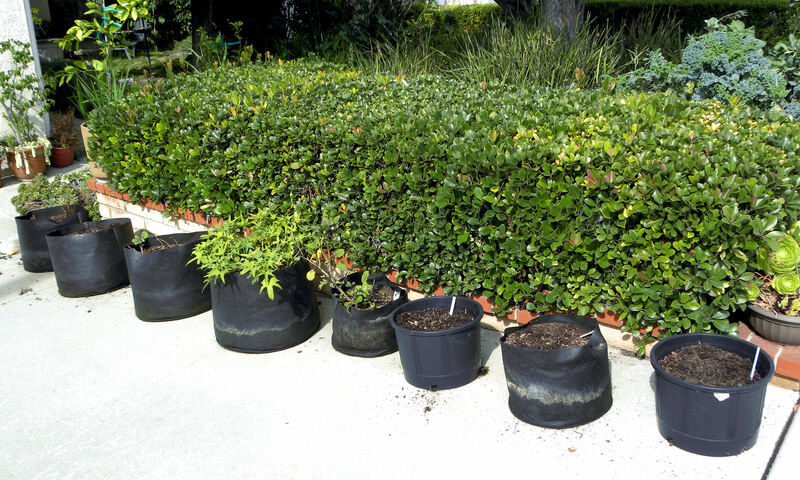 Love the Smartpot lineup, I’m curious to see how the sunchokes grow in those pots. 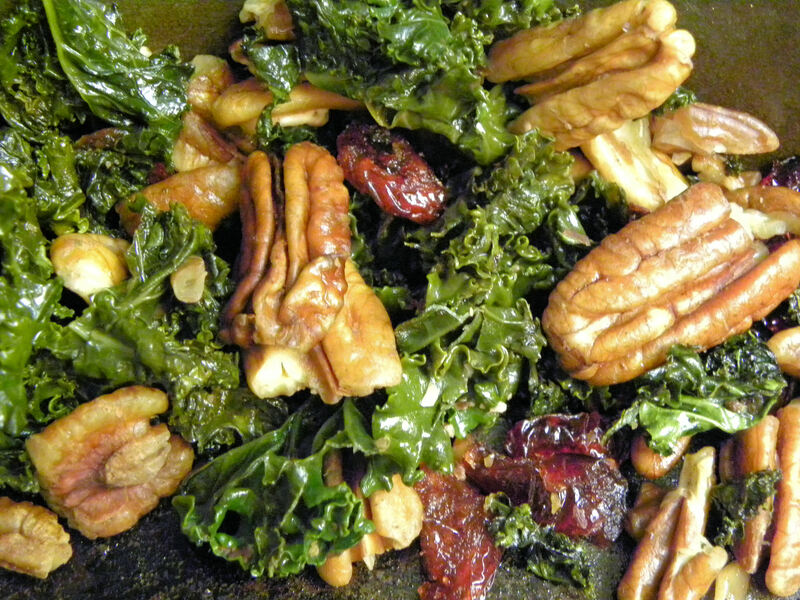 You kale dish looks good. Thanks, Mac. The sunchokes are ready to harvest, but I haven’t wanted to cook them yet. I’ve felt around in the pot and it seems packed with tubers. I can hardly wait to weigh them. It is too bad about the squash this year. I had a zucchini that didn’t have the strength to actually really set the fruit after it was attacked. But it kept pumping out female fruit. I knew that 95% of them would just shrivel up and die so I cut them off as soon as the flower closed. I got a ton of small zucchinis, but after the borer attack no big ones. I tried hand pollinating, but the plant just didn’t have the strength. I’m shocked that it still even put out female fruit at all. Daphne, sorry you had a “no-show” zucchini as well. I’m hoping that we get our community garden up and running so I can garden someplace with sunshine.